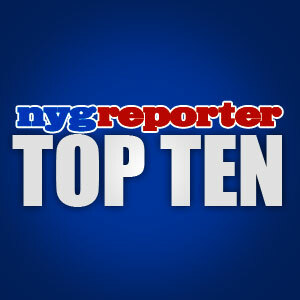 Here is a new segment that we will be doing here on the NYG Reporter, we will call them the unoriginal name of the “top ten” lists. Yes, we understand the cliche but it is still an effective means for communicating pertinent information about the team. The previous article we wrote before this, where we took a look at the fantasy football possibilities got me thinking. I mentioned that I thought WR Hakeem Nicks would break the single season Giants record for receiving yards in 2010. The current all-time record is 1,343 receiving yards, in a single season, set by WR Amani Toomer in 2002. During Hakeem Nicks’ rookie season in 2009, he had 790 receiving yards and six touchdowns, even though he only started in six games. It will be interesting to see how the Smith/Nicks WR duo compliment each other. We could be on the verge of something big here in 2010. Let’s not forget about WR Mario Manningham, WR Ramses Barden, WR Derek Hagan, WR Domenik Hixon, WR Sinorice Moss and the rookie WR Tim Brown that Coughlin has mentioned during interviews. They will be competing with each other during the current OTA’s going on and even more so, come training camp in Albany this summer. We will be doing the running backs and quarterbacks records during this week as well, so be sure to come back and check them out. Let’s take a look at the top ten all-time receiving yards records for the New York Giants. New York Giants all-time receiving yards, per single season, record standings. 1. WR Amani Toomer, 1,343 receiving yards in 2002. 2. WR Steve Smith, 1,220 receiving yards in 2009. 3. WR Plaxico Burress, 1,214 receiving yards in 2005. 4. WR Homer Jones, 1,209 receiving yards in 1967. 5. WR Amani Toomer, 1,183 receiving yards in 1999. 6. WR Del Shofner, 1,181 receiving yards in 1963. 7. WR Earnest Gray, 1,139 receiving yards in 1983. 8. WR Del Shofner, 1,133 receiving yards in 1962. 9. WR Del Shofner, 1,125 receiving yards in 1961. 10. WR Amani Toomer, 1,094 receiving yards in 2000. Are you surprised by the amount of wide receivers on this list that have played in the 1960’s? Do you think that WR Hakeem Nicks can re-write the record books in 2010? This entry was posted on Sunday, May 23rd, 2010 at 9:36 PM and is filed under 2010 Fantasy Football, 2010 New York Giants, Big Blue, Chris Mara, Eli Manning, G-Men, Giants, Giants Coaches, Giants Draft, Giants Front Office, Giants History, Giants Roster, Giants Stadium, Giants Super Bowl History, Giants Training Camp, Giants Transactions, Jerry Reese, John Mara, Jonathan Tisch, Kevin Gilbride, New Meadowlands Stadium, New York Football Giants, New York Giants, NFC East, NFL, NFL Draft, NFL Pro Bowl, NYG, NYG All-Time Records, NYG Draft, NYG Exclusive, NYG Reporter, NYG Story, NYG Top Ten, NYG Update, Pat Hanlon, Perry Fewell, Steve Tisch, Tom Coughlin. You can follow any responses to this entry through the RSS 2.0 feed. You can leave a response, or trackback from your own site.